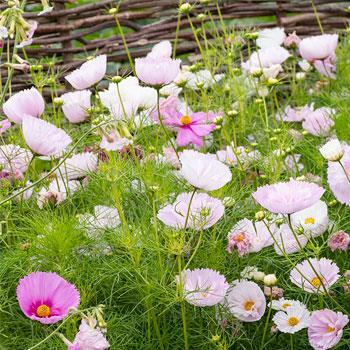 This sweet form of Cosmos was found by a flower gardener in California who saved seeds and sent them along to a seed company to develop and refine. The result is a diaphanous creation, all pastel pinks, mauves and white, some with extra frilly petals, all showing a unique cup-shaped form. Easy to grow, just keep cutting for continuous flower production. Starting Outdoors: Recommended: Direct sow in spring, after last frost. Cosmos are grown for summer cut flowers and for their reliable bloom in hot and dry weather. Pinch out stem tips when plants are 1' tall to help grow bushy, branching plants with lots of flowers. 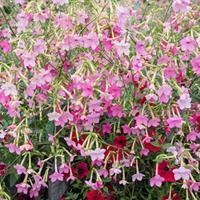 Start indoors for earlier bloom and sow direct for bloom in midsummer. Deadhead regularly and stake early in windy areas, as the branches are quite brittle and can snap off at the stem. Plant: Finely divided ferny foliage on branching stems. May need staking in windy locations. Flowering: "Cups" consist of fused petals in creamy white, lavender, and variations of pink. Seeds: Each flower will produce narrow achenes, similar to the way sunflower seeds are produced.